As fall is full of surprises, one has to think ahead and take into account all the details of a wedding ceremony. Just in order to not fall in panic on the big day, you have a chance to prepare ahead. 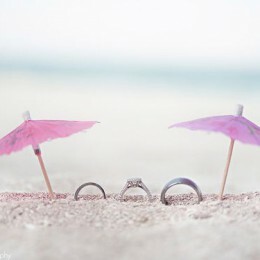 When it comes to such huge aspects as a ceremony venue or a wedding dress, there is no way we can forget something here. Yet, such an event includes some other things that might not seem to be so important at the first glance, but become extremely crucial on the very day of your wedding. One of such details is an umbrella. 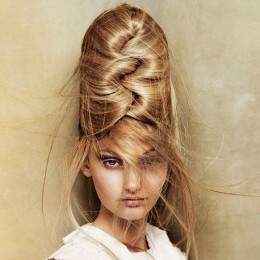 Yes, an umbrella that will protect your hairstyle, make-up and god knows what else if it is showering outside. Such an accessory will by all means serve the best purpose – but only of you prepare it in advance. 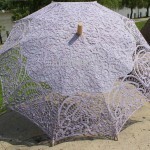 If you do not mind vibrant colors and creative shapes, then this is the umbrella of your dream. You should definitely go for this adorable piece, since it will beautify any wedding, regardless of the style that you choose. The heart-shaped deep fuchsia accessory will perfectly match any dress and make your wedding outfit more complete and elegant. 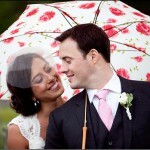 Besides, I doubt that there are so many brides who carry umbrellas around in the first place. You might consider it to a burden, but just think about the awesome photoset that you can shoot with the help of this item. No doubt, you will admire the pictures in your wedding album in a couple of years. If you prefer more classic colors and fits, then I am sure you will fall in love with this extremely exquisite and precious umbrella. The beautiful piece in cream features lace embellishment along the edges as well as the intricate embroidery which adds up to the overall image. 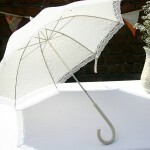 Such an umbrella will obviously create a very sophisticated and a somewhat vintage look. 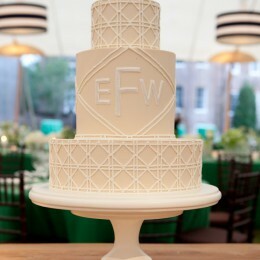 If this fits into the style of your wedding ceremony, then feel free to go for it. If you still would like to opt for something bright, but would prefer a moderate and regular fit, here is another awesome piece for you. 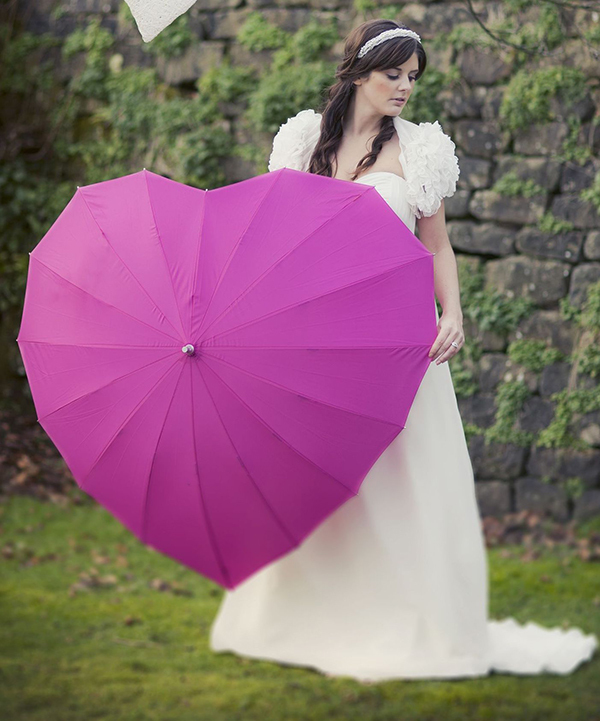 This stylish and cool umbrella in my favorite purple can become another styling accessory in a myriad of your ceremony’s elements. In this particular case, it matches the color of the groom’s bow tie. You can create something more elaborate and say go for purple ribbons around the bridesmaids’ wrists. In case you like simple and modest things, then I have no doubt that you will choose something like this saucy and funky transparent umbrella. Such an accessory will probably protect you from the heavy rain the most – and seems like you can host your beloved one under its roof as well. The main advantage of this item is that it is see-through, which means you won’t cover any part of your face or hairstyle when rocking it around. Here comes my favorite piece! 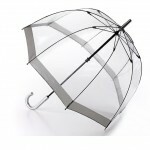 Although it is not going to protect you from any kind of precipitation, you can still carry it around. Just imagine how much admiration you will cause with such an item above your precious head. The delicate violet is combined with rich embroidery and lace embellishment. This umbrella will make an excellent match for any photoset you come up with. And you can also try to match the piece with other styling accessories of your look. If you feel like adding a bit of fur to your umbrella, feel free to do so. After all, it is your wedding and everything is meant to be the way you want to be. The beige umbrella would look quite simple if it wasn’t for the fur framing along the edge. It is this embellishment that makes the item so unique and engaging. Of course, if you happen to reside somewhere in tropics, there is no point in choosing this umbrella. Otherwise, the world is your oyster! 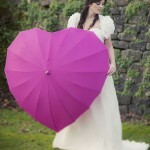 Last but not least comes a very romantic and cute umbrella. The hot red roses against the crystal white background create a fascinating impression. This is the piece you ought to go if your wedding ceremony is styled in similar shades. 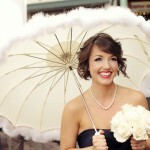 These were the most gorgeous and cool umbrellas that a bride can go for. Which one would you choose?